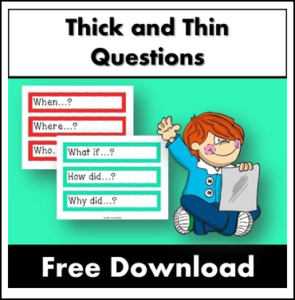 Used many times in the classroom, thick and thin questions are a great way to encourage students to pose interest, deeper questions and move their understanding towards higher order thinking. I have printed, laminated and then placed magnets on the back so I can throw these questions quickly on to the whiteboard and test students understanding. They also double up as great printables for a classroom poster. Please study the preview images or download the preview to make sure you understand what you are downloading. This product is designed for Year 1 to Year 6 students. Please contact me if you have any questions prior to download. If you enjoyed this free download please leave a four star rating. Key Historic Events in Aboriginal Australia – 12 slides on Australian History. All about Australia – 10 Questions and Answers Geography Studies. Aboriginal Dot Painting Activity Information slides instructions printables. Australian Geography Worksheets and Activities Maps and Printables. Christmas Around The World – 9 Countries, 37 Activities.